The Buchan is in the shadow of The Bruce's Stone which looks over the site of The Battle of Glentrool. This battle marked the turning point for Robert the Bruce in his campaign to defeat Edward I and his English army. On 31st March 1307 part of Pembroke's English forces under the leadership of Lord Clifford of Brougham and Aymer de Valence were defeated by Bruce's army - a third their own size. Although it wasn't a major episode it launched Bruce's successful campaign and gained the respect of the Scots nation, culminating in his victory at Bannockburn seven years later in 1314. The house dates from the 17th or 18th century and was converted from a farm to a hunting lodge by the Earl of Galloway in 1855. It was probably also used as a retreat from the ladies! It went back to farming use and in 1947 was acquired by the Forestry Commission as part of the Galloway Forest Park. It was used as a farm until 1980 when it was taken over as an outward-bound centre. Over subsequent years it fell into a state of disrepair until we discovered it in 1996. We embarked on a three-year programme of rebuilding and modernisation including the installation of the hydro-electric system. 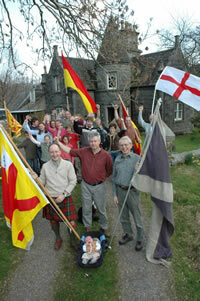 On March 31st 2007 we celebrated the 700th anniversary of The Battle of Glentrool with friends and family and special guests including a direct descendant of Robert the Bruce - Robert Bruce, aged 12 weeks!